Time to Smash this Tyre-Slashing State and Build Something Better. David Whyte on Spain’s return to Francoist repression. On the morning of Wednesday the 4th of October 2017, three days after that remarkable referendum, and the morning after a general strike that saw between 2 and 3 million people on the streets, the residents of three small towns in Catalonia woke to find their tyres slashed. It is unlikely that the people of Verges, Medinyà and Sarrià de Ter will ever find out what happened, but locals think it was members of the Guardia Civil, holed up near those towns. It may be true or not, but this is a pretty accurate metaphor for the position of Spain right now: the tyre-slasher state. It is almost as the Kingdom of Spain now has so few options, all that is left is vigilante violence committed by its platoons of para-Francoist thugs. Spain is clearly unable to deal with the situation through politics. After the successful resistance to the full force of the paramilitary operation to stop the referendum, it is also apparently unable to deal with the situation by controlling public spaces. In the constitutional crisis that is likely to rumble on for sometime now, Spain will certainly not recognize the legitimacy of Catalonia’s independence. The tyre-slasher state is certain to attempt some form of repression. The Guardia Civil has not left Catalonia, and indeed the extension of the permit for the loony tunes cruise ships in Barcelona harbor yesterday is one indication that there could be an attempt to continue the occupation. There is also a consensus emerging in the Spanish centrist parties to implement article 155 of the Spanish constitution and eradicate Catalonia’s devolved powers. In other words to make constitutional what it has already done using arbitrary emergency declarations. The people most at risk of being targets of any extension of repression, the political organisers of the referendum, feel that the most likely outcome is a slow, stretched out form of judicial repression in which Spain enlists the courts to surcharge, prosecute and imprison the people who disobeyed Rajoy. Rafael Hernando, spokesperson for the PP said “we thought we saw the end of Naziism in 1945. Now it is back”. This was no Freudian slip, but a deliberate depiction of the Franco years as ‘not Naziism’ and indeed as a phenomenon more political acceptable to Spain than what the Catalans are doing now. In the weeks running up to the election, the left independantists had been increasingly under pressure from the Spanish political parties, media and police. The PP taunted the Catalonian government by accusing it of being under the influence of extremists. By this they meant the left-independent party in the regional parliament, the Popular Unity Candidacy (CUP). Invoking the traditional Spanish demagoguery of Basque ‘terrorism’, PP politician Pablo Casado warned of “the batasunisation of CUP and the Catalan process”. The Spanish state tried, and spectacularly failed, to isolate the left independence movement from the larger mainstream parties supporting the referendum. For many observing what happened from the outside, Spain’s strategy was implausibly amateurish. But it did have some rationale. By attacking the left in particular, Spain sought a strategy of divide and conquer. Madrid probably calculated that because the neighborhood resistance had a high level of involvement from autonomists, anarchists and the social centres, it would be relatively easy to provoke the sections of the resistance most likely to respond violently. Barcelona is a city that has never been scared to respond to tear gas and batons with bottles and bricks. Indeed, it is possible that there has never been a major demonstration in this city that did not involve some skirmishes with the police, fires in the streets or the smashing of high street banks. Not this time. More than 40,000 people charged down the narrow Via Laietana towards the Spanish National headquarters – that everybody knows well as the site of Franco’s torture cells – on the night of the general strike. What happened next was unusual for anywhere, let alone Barcelona. The crowd stopped in silence before the police cordon to sing the Catalonian anthem Els Segadors. Catalan TV footage later showed the terrified faces of a heavily armoured Spanish police, utterly helpless in the face of an incredibly powerful show of strength. The crowd expressed its total and utter power in the moment it stopped short of using physical violence against those they see as the personified remnants of Francoism. The discipline and the determination to use a strategy of non-violence was remarkable. Anarchists and autonomists organizing in the neighbourhoods repeated the same mantra as everyone else: this is a politically unique moment and a violent response would play into the hands of the state. When the Guardia Civil surrounded CUP headquarters in Barcelona on Wednesday, the people inside the building later describe the events as weird. The police arrived, asked to enter, and then when entry was refused, they backed off at the end of the street and waited for the crowd to appear. Around 2000 people arrived to protect CUP offices, but did so without being provoked into violent confrontation. After 5 hours, the police left the without either fighting or raiding the offices. The anti-capitalist and anti-fascist left across the different autonomous regions in Spain have for years been telling anyone who would listen that the old remnants of the Francoist state were never completely dismantled in the post-Dictatorship years. And, that those dark forces could easily rise again. Now we know they were right all along. Across Barcelona and the towns and cities of Catalonia much of the chanting and sentiment referenced the civil war and the resistance to Spanish Fascism. “No Pasaran”, “We are not afraid” and singing the famous anti-Francoist resistance song L’estaca. If this has looked like a distinctly like a scene from Spain dark past, that’s because it is essentially Francoist. In its general lack of support from the British left generally, and the European left generally has been caught in the headlights, caught out by an unsophisticated and uninformed reading of the situation as ‘nationalist’. In her column in The National, Cat Boyd made a point that is so taken for granted in Catalonia but needs repeated time and time again here: that in their hatred for ‘nationalism’, some socialists have failed to notice the obscenity of Spanish nationalism. En Comu, the broad left alliance that involves the Catalan Podemos (‘Podem’) and people from the social movements have a slightly different problem and the current Mayor of Barcelona, Ada Colau, who came to power straight from the grassroots anti-eviction movement ‘Pah’, were lukewarm about the referendum until the scale of the repression began to reveal itself. And this partly explains the lukewarm response of the European left. The European left has tended to fetishise en Comu as the only left in Spain, because of the Indignados movement and the rise of Podermos. If Podermos doesn’t support the referendum, then neither will we! The problem is that in Catalonia there isn’t really a clear split between left independentists and the rest of the left. If Podermos (and Podem) are officially opposed to independence, a large number of en Comu members and supporters support independence. Indeed, todays left independence movement has a history in popular struggle that pre-dated and then led, the Indignatos movement. The left independence movement is not separate from the movement led by Podermos. They occupy the same political space. Yet it is the left independence movement in Catalonia that must take the credit for pushing and cajoling and ultimately forcing the centrists and a large section of the business and political elites to this decisive moment. Would there be any possibility of a referendum happening on Sunday without the shrewd agitation – inside and outside the Catalonian parliament – of the largest left party in the regional parliament, the Popular Unity Candidacy (CUP)? It is the ten CUP MPs that have constantly harassed and embarrassed the centre into action. Indeed, official support for this referendum was initiated by CUP last year and agreement to hold it secured only after it agreed to ratify the Catalonian government’s budget. Outside parliament, it is the broad front of the left independence movement that has organized and nurtured the possibility of an alternative politics in their communities. Most importantly, it is this movement that seeks independence on one condition: that the old oppressive order – the rule of elites – must go. This movement is not simply demanding a new ‘nation’ under the Senyera. It is not demanding that institutions of government, of law and of economy are reformed to establish some kind of new ‘Catalonian’ cultural sensibility. This movement is demanding that the old order and the old institutions must be replaced by ways of living and working that are not oppressive, are not crisis-ridden and do not sow the seeds of yet another tyre-slashing coup. With the exception of the important solidarity events across Scotland, the left across much of Europe has had little to say. The English left in particular has generally failed to recognise that within this popular movement there is real capacity for social revolution and a new, emancipatory, politics in the new republic. Perhaps the difficulty is that this popular movement does not correspond to the blueprint of social transformation and social revolution that is written in the textbooks. It does not correspond to the theoretical dichotomy of reform and revolution, or the simple and clear dialectal path of enlightenment that the seemingly endless myriad of fringe left groups and parties likes to lecture everyone else about. Far less has the struggle for self-determination in Catalonia captured the imagination of Corbyn’s Labour Party and Momentum. This is a spectacular mistake. It is a mistake because the left independence movement has developed a strategy to win municipal socialism that has been more successful than anywhere else in Europe in recent years. And this is a decisive for developing real practical and workable alternatives to capitalism. It is also a mistake because the Spanish state knows this and knows that its best chance to win is to defeat the momentum the left has built. The left in the UK and in Europe, slow to develop an analysis of the situation in Catalonia, needs to show its solidarity with the radical left and the community resistance now, before it is too late. 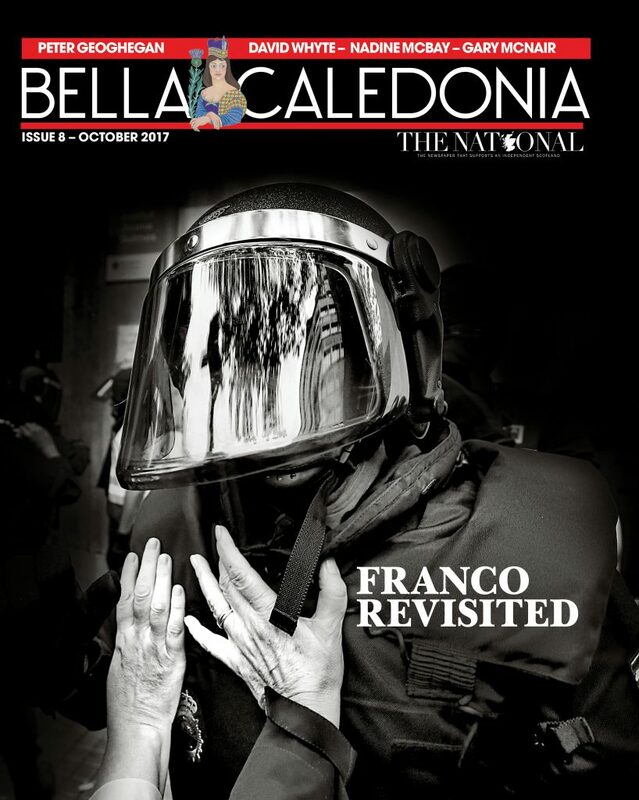 This article was first published in the October issue of Bella Caledonia – available with The National. Bella Caledonia remains free (and ad-free) and takes us hundreds of hours a month to research, write, commission and edit. If you value what we do, please consider supporting with a recurring monthly donation of your choosing. GoCardless to set up a small monthly donation to support independent journalism in Scotland. This is a valuable piece David and deserves to be widely read. I agree wholeheartedly about the importance of both the CUP (an underrated outfit in the European left) and, more recently, of the defence committees – which as you say show the potential for street level social movements to move over into the field of direct democracy – as has happened recurrently over the past decade and more (think Occupy, the squares in Spain, Tahrir in Egypt etc). This is the shape of working class mass agency in the 21st c (at this stage in its development at least) and people on the left would do well to study its actual dynamics and weaknesses, rather than try to reconstruct a nostalgic image of the workers movement from the 1930’s or similar. I wrote about some of these dynamics here on Bella before the GE. I disagree about the reception from the left in the following regard. First, I think you are being almost too charitable to some on the left who oppose, or are disinterested in the Catalonia question, by portraying them as beholden to sterile or defunct dogmas. Here’s Lenin – often (very wrongly, in my view) depicted as a font of dogma – taking a perfectly insightful and pragmatic view of the Irish republican movement – despite it’s real limitations. hopelessly incapable of envisaging a social revolution as a living phenomenon. Lenin wrote the note in criticism of figures – mainly on the right of the socialist movement in Russia – who dismissed the political character of the Easter rising. Then as now these figures were typically reformist in character. What causes consternation among many on the British left over Scottish indy and now the Catalan movement is their strategic orientation on the [capitalist] state – the vehicle through which they believe progress will come. So I can’t agree that the movement “does not correspond to the theoretical dichotomy of reform and revolution” – and that this is what confuses today’s left cynics. Neither can I agree that the problem lays with those more typically denounced elements of the left (you know – bug-eyed newspaper sellers and so forth). Actually many on the radical and revolutionary fringe of the left have had a much better orientation on national independence – including on Catalonia. The problem has been with the larger reformist blocks – mainly for the reason I outlined above. I’m pleased that you are only taking issue with two sentences I wrote in the piece. To be honest those narky sentences were written after a number of frustrating discussions with friends of mine who didn’t have a clue what was going on, and responded in a crude doctrinaire fashion: “I can’t see the calls for a revolution across Spain…” “this is being orchestrated by the ruling class” etc. Part of the problem is also that the left has a false sense of the strength of the grassroots strength of the Indignados movement, and Podemos, and in Calalonia of en Comu (probably because they are led by the highly impressive Ada Colau, and because they won Barcelona which is a major achievement in European terms no doubt). Now I think Barcelona en Comu are really important and as I say in the article, many of the key people in en Comu are part of the movement I describe. But because Ada Colau has taken a position in opposition to independence, as did Pablo Inglesias and Podemos, this is a problem for som many people in the British left because they are looking at them as a kind of barometer of the ‘left’ in Spain. This is a starting point for many people. The next point in the discussions I have had with people I know on the anti-capitalist/Marxist left in England is to discard any possibility that this could be a social revolution because it is a ‘nationalist’ movement, and one supported by the ruling class at that. Now of course this is partly true, and I understand the suspicion that people have for any left movement that seeks real social and economic change on those terms, but of course, you need to understand both the recent and long history as well as the particular dynamic of popular power that has been germination and nurtured over years. And in terms of your homage to Lenin, we could also recall his comments on support for “bourgeois nationalism” when it is directed against oppression but at the same time strictly opposing “national exclusiveness.” I think the English left’s position replicates the position so many took on the Scottish referendum. Of course I think that position was wrong, but in Catalonia, this is clearly a revolutionary situation and it is staring us in the face. There is nothing wrong with the idea or practice of selling tiny circulation left newspapers. I’ve written for a very large number of them over the years. But the point is that we know that a religious observance of a doctrinal interpretation of the left cannon (whether its based on some version of Leninism, Trotskyism or anarchism) has left so many caught in the headlights by their doctrine when they cannot recognize this historically decisive moment as it careers towards them. We know this because the solidarity efforts, outside Scotland, have amounted to next to nothing. Whoever waits for a pure revolution will never live to see it, indeed. As for revolution vs reform. This is a dichotomy, normally strictly applied, that doesn’t make sense to me. Many of the social movements and experiments we see in the Catalonian solidarity economy would be dismissed by revolutionary purists as reformist. Parliamentary strategies also dismissed as reformist. Well, the point is to change social relationships and to sweep away capitalism and patriarchy, then we need to support strategies that can support this, that’s all. But you are right, the problem does not lie with the left, bug-eyed, caught in the headlights or not. The most immediate problem is the question of how to provide the support that the left independence movement needs now, and indeed at any point in what are likely to be dark times ahead. Don’t get me wrong, I don’t think this movement will run out of steam, but there is a real chance the repression will target the left. This weekend, a Social Assembly of Catalonia is going to bring the neighbourhood and social movements I discuss in the article together to “elaborate an alternative social and economic agenda for the coming Republic”. This is a significant moment in what might well turn out to be a social revolution. David, as somebody on the Left, I cannot support Catalan independence, because of the consequences of an independent Republic, which are unforeseeable in a way which is just not the case in terms of Scotland and Ukania. B) The knock on effect: if the Catalans become independent, so will the Basques and possibly the Galicians too. So, we are talking about the Balkanisation of Spain, and if that happens, there is a very good chance that there will be a war, in a country which holds the record for civil wars in the 19th century, and one of the worst civil wars of the 20th. It’s not hyperbole to say that. ETA were active until just a few years ago, and the Spanish Right Wing are deeply entrenched in a “bunker” mentality which shows all the hallmarks of their fascist past. Rafa Hernando, David, who you mention, currently the PP spokesman in the Spanish Parliament, was in the AP in the 80’s – basically Francoists turned democrats – and according to the best commentator on Spain, Vicenç Navarro of the University Pompeu Fabra in Barcelona, had sympathies for the extreme right wing group, Fuerza Nueva. Another example: the editor of El Pais newspaper – which has moved from the centre to the right and even the far right on the Catalan question, and now sacks any journalist who disagrees with its editorial line – until the day before yesterday was Juan Luis Cebrián, the son of the editor of a now defunct newspaper of the Franco regime called “¡Arriba!”. Recycled Francoists, and their heirs and successors, basically run Spain. But that was the case in Germany too after 1945 until at least the 1960’s when a huge shift took place in German society. It’s important to contextualize it. C) At the same time. it’s wrong to write off the Spanish “Transition” to democracy entirely, and disrespectful to the thousands upon thousands of people who died or were imprisoned or exiled fighting against a ruthless and murderous dictatorship which, let’s not forget it, could have been ended in 1945 by the Allies if it were not for the staunch opposition to an intervention in Spain by British foreign secretary Anthony Eden. The Spanish Republic was betrayed three times by Britain and France: first when they declared a policy of non-intervention in 1936 which the Germans and Italians ignored; second when they recognized Franco as the legitimate head of state in 1938, and thirdly in 1945 when the Allies could have toppled him all too easily…. thousands of Spanish Republicans, in exile in France, died in Nazi concentration camps, let’s not forget that either…. But the “Transition” is shrouded in myths and half truths, some of them perpetrated by the Left. It is certainly a gross exaggeration to describe Spain as a Francoist State. Spain is unquestionably a democracy formally speaking, it has a democratic Constitution and democratic institutions. But what it also has is a marked “sociological Francosim” as it is often called, because there has been no attempt at reconciliation about the Civil War and Franco was a tyrant who brainwashed the Spanish people for 40 years. Nothing has been done to counter that. For the Spanish Right Wing, Franco saved Spain from Communism…. This “sociological Francoism” and a democratic culture which is a mere four decades old explains the bizarre reaction by Rajoy and his paramilitary police to the referendum…. The Spanish Establishment try to present the “Transition” as a process which was sparked by an enlightened King and a reformist political Francoist class. In actual fact, it was the struggle of workers all over Spain who forced the Regime to change into a democracy, particularity the clandestine communist union the CCOO. There were 17,455 strikes of work in the first quarter of 1976, 1, 522 in the 2nd, 6,611 in the third quarter, and 8,879 strikes in the last three months of the year before the regime finally reformed (figures from “El Fin de la Dictadura” by N Sartorius and A Sabio). Does that sound like a regime that wanted to reform? The Constitution of 1978, won with huge sacrifice by Spanish workers, for all its failings, has brought the only 40 years of stability, prosperity, democracy and peace that Spain has ever had in its entire history. It needs to be updated and amended. PS: “No Pasarán” means “They will not pass” which was the cry of the Communist “La Pasionaria” in a famous radio address when the Republican government had fled Madrid for Valencia and Franco was at the gates. You can see her statue still on the banks of the Clyde in Glasgow. “No tinc por” is Catalan for “I am not afraid”. I do not want to trivialize the scenario you outline, and it is possible of course, but we should not forget that this is exactly the same threat that the PP and other political forces are currently holding over the Generalitat in order to neutralize the Catalonian bid for independence. Something much more terrifying than ‘project fear’ perhaps, but based upon exactly the same principle. Every day we move away from the referendum, a UDI looks less and less likely. And this holds out a much more pressing threat: that the Spanish state will feel sufficiently buoyed by the lack of an open and public international condemnation that it will impose some kind of constitutional exceptionalism (perhaps invoking article 155, perhaps not) and then begin the arrests, the prosecution and the jailing of a very large number of people who organized the vote. This is the first threat. The second (and this is the underlying message of my article) is that it will rely not on widespread violence by its own paramilitary forces, but by encouraging the rise of vigilante fascism that we saw at the weekend in Valencia, police effectively permitting violent attacks on Catalonians in the street. The complex inter-connection of social forces that makes up Spanish hegemony today is not comparable to the 1930s. Just like the situation is completely incomparable to Scotland, so it is incomparable to the civil war or Franco years. That is not to say the dark forces of Francoism are not woven into the fabric of the repressive apparatuses of the state. Your examples could indeed be multiplied. But (and you call for this in your response), we cannot underestimate the force of the progressive left in Spain. Also absent from the debate is the complex issue of where different fractions of capital stand here: the issue is not really moving the headquarters of banks, but how the 25% of Spanish exports out of Catalonia can be secured and where Catalonia fits into increasingly complex global value chains. So there are very powerful interests that are probably powerful enough to prevent a situation that destroys them. I am not being complacent, but recognizing that the institutional development of both the public and private sectors is incomparable to the 1930s. The chances of an underground armed resistance strategy emerging in Calalonia and re-emerging in the Basque Country are not impossible, but remote unless there are a number of very significant changes in the wider geo-political situation. The core message of the piece really is that now what has happened has happened, the left across Europe must show solidarity for two reasons. First, there is a likely clampdown that will almost certainly be punitively and disproportionately targeted against left independentists, not least since they were the main organisers of the resistance to the Guardia Civil and the Spanish National police. Second, the experiments in municipal socialism at a local level in Catalonia (and the Basque Country and more sporadically in other parts of Spain indeed) are probably more advanced than anywhere else in Europe, and there is an opportunity to build self-determination in a social and economic sense. Building co-ops, food sovereignty and energy sovereignty and re-socialising amenities not only bolsters the prospects for a different kind of society, based on solidarity and co-operation in Catalonia, but also in Spain. The context is different to the 1930’s, you’re right, it is an important point, but I have zero faith in the democratic credentials of the Partido Popular and remember, nobody ever thinks these things can happen. They didn’t think it in Yugoslavia and they didn’t think it could happen in Spain in 1936. Azaña, who was the President of the Republic for a spell, and then its Defence Minister, never took the Generals seriously. They were just a bunch of clowns to him. He was a writer and an intellectual and he couldn’t take the Generals as a serious threat, they seemed too ridiculous…one of them was Mola, another was Franco. If it wasn’t for the EU, I think there would have been if not a full scale coup, a serious authoritarian clamp down when the indignados began the 15-M in Madrid – there kind of was anyway but the EU saved us from greater evils, to use Rajoy’s term. All the police violence in Barcelona had already been seen all over Spain with the indignados, with agent provocateurs often in the crowd to justify mass State violence. Which is to say, the only thing saving Spain is a European context which is more democratic than Spain is. If that context were to change – say France votes Le Pen – then the PP will be leading the way of the European far-right, and will usher in if not fascism – times change – “Putinism” – that’s what we’re talking I think: Turkey, Russia, that kind of thing. They are the Party which still to this day refuses to condemn the coup of 1936, in a country where 130,000 people continue to molder in unmarked graves after mass extra-judicial executions. Zapatero passed a feeble piece of legislation to address that situation called “The Law of Historic Memory” as you may know, and Rajoy, when announcing his budget to the Spanish Parliament, allocates zero pesetas to it with real zeal and pride… gloating over the fact. The Spanish Right are not content with winning the Civil War. They want to win the peace too. They’re the worst ever. They are the Party which continues to defend the Spanish State paying for the upkeep of Franco’s tomb just 20 minutes from Madrid, the Valley of the Fallen, which is the biggest mass grave in Europe: around 30,000 Republican prisoners of war lie buried there, thousands of them unidentified… it’s a total disgrace and an affront to democracy and human rights. I can only agree with Podemos and their description of the people who run Spain as a “caste”. That’s what they are. A very closed clique of parasites who run the country, from the King down. By the way, the comparison with Germany after the WWII is enlightening. Germany was run by ex-Nazis until the late 1960’s when society changed. That is basically what has happened in Spain. Nobody bothered too much when the country was booming, but when the recession came in 2007, all the cracks appeared. This has evidenced itself in two ways: the rise of Podemos, and the rise of Catalan nationalism. …the CUP have been betrayed by Puigdemont, but what were you expecting from the Catalan bourgeoisie? Anyway, there are going to be elections in Catalonia according to all the experts; it’s the only escape route left to Puigdemont and Rajoy… it suits everybody and will solve nothing. The statement apparently attributed to Cat Boyd – “in their hatred for ‘nationalism’, some socialists have failed to notice the obscenity of Spanish nationalism” surely applies also to the UK state. You can see and sense (British) nationalist aggression, disgust even, in the expressions of ‘unionist’ politicians whenever they discuss Scottish independence. It seems hard for them to disguise it. It is almost as if we on the Yes side are voting to do away with their elderly relatives. In other words, theirs is an extreme reaction. The reality is that independence is not about nationalism, it is about peaceful, democratic, liberation, self-determination, freedom and to some extent decolonisation, and a shift away from what is clearly an oppressive, even rabid, celebratory, superior form of nationalism. The other misleading aspect of this debate is that it ignores the fact that the definition of (British or Spanish) unionism is that it is a “Nationalist political ideology”. We can see who the ‘extremists’ are here, and they are not those of us peacefully voting for independence, in Catalonia or in Scotland. If anything, ‘unionism’ as we call it may be the worst and most extreme form of ‘nationalism’ (e.g. former Yugoslavia, USSR, pre-1944 German ‘re-unification’/expansion, and indeed Spain). Maybe on reflection the ‘National’ was not a good name for an indy supporting paper, assuming that is what it is? And neither is the name Scottish ‘National’ Party. We fall into the ‘unionist’ (i.e. nationalist) propaganda trap on both counts. Fascinating read, until now I did not believe in the TARDIS or Political Stasis. Spain has not changed since the 1930’s, Franco is still alive, Communism has not collapsed. Oddly, I CAN agree that the political systems which got is here, will not take us forward. However looking for answers, like CUP or Podemos, whose origins are found in Chavez’s streets of Caracas, will not take us anywhere. The Social Democracy, plurality, and Social Justice of Nicola Sturgeon offers more hope, and TRUTH.